Photo by Dennis Lyzniak Franco Wicks (Roderick Randle) appears in a tense scene with thug Luther Flynn (Daniel Nieves). Photo by Dennis Lyzniak Arthur (Mark Kroczynski) relates his past to the audience. 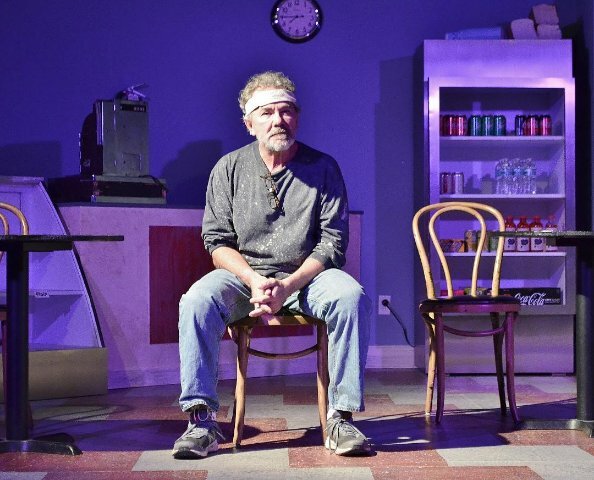 Parts of Pulitzer Prize-winning playwright Tracy Letts’ Superior Donuts are as sweet as a sinful confection in the shop bearing the play’s title. Indeed, these moments will make you grin from ear to ear like the ambitious Franco Wicks, one of the main characters. The scenes, which for the most part offer empty calories, suggest a sitcom. And that’s hardly a surprise – the play spawned a TV comedy series. But the play is more than a sugar rush. 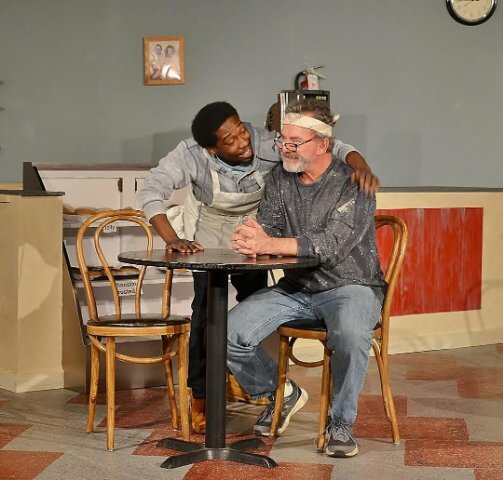 To be sure, Superior Donuts, running through Jan. 20 on Main Street Players’ stage in an often-strong but imperfect production, isn’t a great play. But it contains enough meaty material and moving drama to consider it a work of substance. It balances lighthearted fare with topics that exercise the mind. In fact, several critics thought enough of this work to nominate it for the 2009 Harold and Mimi Steinberg/ATCA (American Theatre Critics Association) New Play Award. Surely, many will identify with Superior Donuts’ focus on the American Dream as well as the power of friendship, community and redemption. More specifically, 20-somethings might see themselves in the ambitious Wicks, a young black man living in Chicago during the late 2000s. His unbridled charisma and hunger for success as well as change is contagious. Further, folks who fought in or lived through and opposed the Vietnam conflict will likely see themselves in draft dodger Arthur Przybyszewski (a terrific Mark Kroczynski). This Polish-American is an unyielding, seemingly content, business owner who likes things the way they are. The conflict and contrast that drive this play pit the outlooks of the hippie Przybyszewski against his new employee, Wicks (an energetic, entertaining Roderick Randle). It’s a tug of war between remaining steadfast in the past and changing with the times. The sole setting is the Superior Donuts shop in the diverse but violence-prone historic uptown Chicago neighborhood. Przybyszewski’s family established the store decades ago. Now he owns it and finds comfort in the status quo. Nevertheless, his resistance faces tough tests from Wicks and next-door Russian businessman Max Tarasov. However, the donut shop owner’s toughest match, and biggest influence, is Wicks. To say the least, the pair might be the oddest of couples. Sure, they bicker. But the younger man’s personality and positive nature draws you to him like honey beckons bees. And Roderick Randle shines as Wicks. He’s a spark plug, delivering deafening jolts of enthusiasm and electricity without overshadowing his castmates. Randle, in perpetual motion, has wide, enthusiastic eyes and a smile as bright as a lit-up Christmas tree store. These expressions help the actor nail his character’s uncontained exuberance. Picture a young Wesley Snipes. But Randle, through a multi-faceted performance, also imbues Wicks with impulsivity and anger. At least once, the sulking young man leaves the shop lightning fast like a video game-obsessed child told to stop playing on a weekend. Still, Randle’s strongest dramatic moment comes at the end. The weight of disappointment and pain (emotional and physical) has crushed Wicks. He looks so convincingly depressed and teary-eyed, it’s clear Randle has internalized these feelings in an impressive display of method acting. Meanwhile, as the shop’s owner, Kroczynski delivers a varied portrayal in a part requiring that an actor convincingly convey many emotions. This veteran performer lends his character a seemingly natural combination of complacency, weariness, apathy and a defeatist demeanor. Moreover, he does so without depressing us or making us dislike Przybyszewski. This rebel is hiding behind a façade. It amounts to armor which might seem hard for anyone to penetrate. That is, if you didn’t know, for instance, Wicks’ power to see beyond that exterior. Of course, Przybyszewski opens up. That’s especially true during the latter half of the play. To his credit, Kroczynski makes the character’s transition seamless. He gradually injects palpable life into the man. But mostly, the character opens up to the audience. Through several monologues, he relates his story, making us understand him more. And Kroczynski is especially effective while delivering these speeches. To transition to these moments of memory, lightboard operator Angeline Guifarro dims the lights, creating the perfect ambiance. Then, the actor slowly and deliberately sits downstage. Perhaps he’ll pause for a moment, sigh, look into the distance or make a facial expression. All these acting choices add to the impressive nuance. Kroczynski talks to the audience as though we are his friends. He’s charming and friendly. In addition, he imparts natural conviction and nearly tears up while recalling a painful incident. Speaking of the past, many folks probably would like to think we’re beyond calling African Americans “colored.” But with the state of race relations today, some might fear this term will re-enter our collective dictionary. The character of Lady Boyle (a loud, eccentric, but well-meaning Joanne Marsic) is a frequent visitor to the Superior Donuts store. At one point, she refers to Wicks as “colored.” Nevertheless, it’s clear she means no harm. In fact, the play’s treatment of race is hardly complex. It appears Letts wants to make us aware of the issue, but he couches it through a few jokes. But there’s nothing funny about a line Max utters. It, unfortunately, rings especially true today, in a world seemingly sinking into more chaos with each passing day. Max is seeking the American Dream. Unfortunately, Bob Sharkey, who plays him, comes across mostly as a comic figure. He needs to imbue the man with more genuine desperation. Director Daniel Nieves, who also plays thug Luther Flynn with palpable menace, guides this cast with comic energy. In addition, Nieves smartly stages the play and makes sure its pathos touches us. Behind the scenes, Angie Esposito’s costumes fit the characters’ personalities. Also, Amanda Sparhawk’s set convincingly suggests a plain, run-down, old-fashioned shop – showing just how behind the times its owner is. On opening night, several actors stumbled on their lines more than once. Also, some responses came too quickly, sapping them of spontaneity. But there’s time for Main Street Players, which is starting its third year as a professional company (it has existed since 1974), to fix these issues. Most are familiar with playwright Letts through his Pulitzer Prize-winning dramedy, August: Osage County. While it’s a lively, engaging, secret-spilling, dysfunctional family play that’s unapologetically vulgar, it’s overrated – especially with its 3 ½ hour run time. By contrast, Superior Donuts is underrated. Again, you wouldn’t place it among the great plays. In addition to its sometimes sitcomy feel and predictability, more details about Wicks’ “Great American Novel” would be nice. Nevertheless, the play’s mixture of comic and dramatic elements, powerful resonances to today and lively dialogue make it a work that will resonate in some way with many. 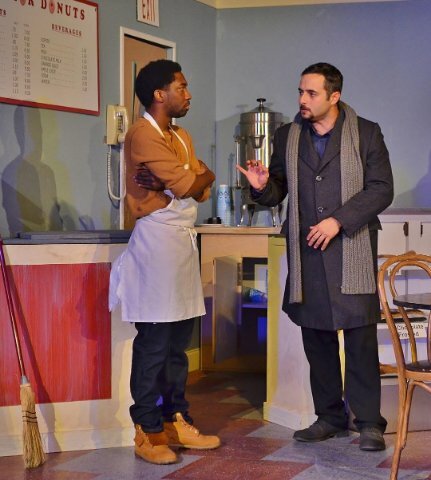 Superior Donuts runs through Jan. 20 at Main Street Playhouse, 6766 Main St. in Miami Lakes. Show times are 8 p.m. Thursday-Saturday and 2 p.m. Sunday. Tickets are $30 for adults and $25 for students and seniors. Call (305) 558-3737 or visit mainstreetplayers.com.